Acne is still considered one of the most common skin conditions and can affect up to 85% of all teenagers and over 30% of the adult population. Acne is also directly related to enlarged pores, blackheads and whiteheads. In some severe cases inflammatory acne can cause ongoing discomfort and permanent scarring. Common treatment options for acne include topical or oral medication, facial chemical peels and some laser therapies. The Spectra Peel Laser Treatment treats the current ongoing acne condition and prevents future re occurrence of acne as well. After a few short treatments clients typically experience less acne, reduced oil production in the skin, significantly improved skin tone and also results in reduced pore sizes and redness and improved skin tone and color. 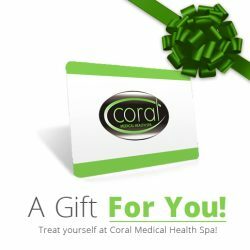 At Coral Medical Health Spa we also have treatments for Acne Scarring in DermaSweep MD Microdermabrasion Treatment or our Laser Resurfacing Treatment. In addition to our laser acne treatments we also offer acne skincare and acne facial treatments such as the mediBac Clearing Facial or ClearStart Facial by Dermalogica. Please come in for a free consultation with one of our skin therapists to learn more and see what treatments are best for you.